Hi, friends there! Trusted by users worldwide, Focusky has made great achievements over the past few years. In return, 3-months Focusky Pro plan which is worth $24.75 in normal price, now is being given away for TechnoGiants readers, you can get it for free here. It’s a limited time giveaway (before 20th, June 2017). So, Don’t hesitate to get it for a try! Have you ever been amazed at the presentation or animated video made by others? Do you want to create one like theirs? What should your next step be? Here, Focusky Pro comes the solution. A presentation maker, Focusky Pro can assist you in creating a killer HTML5 presentation or animated video like a pro. It comes with an intuitive user interface; you can navigate all the features at the drop of a hat even if you are a novice. Focusky Pro consists of plenty of outstanding features, helping users create an awesome visual experience for their audiences. Some key features are listed below. Here comes a saying that everything is difficult at the start. For most of the users, it can be quite a task to start a presentation. Keeping this in mind. Focusky offers rich templates that are highly customizable to suit a wide range of industry. Thanks to this, you don’t need to waste time on designing the layout of the presentation, instead you can spend more time and efforts on the content building. By the way, the templates available in Focusky also give you some inspiration about how to make a quality content. Some presenters complain that the slide transition effect will distract audiences instead of keeping them interested. Do you have similar experience? If so, don’t worry! With Focusky Pro, now you can say goodbye to the traditional slide-to-slide presentation. Focusky Pro has amazing 3D transition effects such as 3D zooming, panning and rotating effects, which makes your presentation play like a 3D movie and attracts the attention of your audiences throughout. Nowadays, multimedia are widely recognized as an effective tool for the communication between presenters and audiences. Not only can multimedia make your points easy to understand, but also it can engage your audiences and keep their interest going. Focusky features a multimedia option that enables you to insert the media rich elements such as images, videos, audios, animations, links, charts and roles based on your preference. The linear nature of traditional slides is not powerful enough to show the complexity of a matter. Considering this factor, Focusky comes with a Mind-Mapping feature that allows you to create an animated presentation in an organized and hierarchical way. You are able to wrap up your ideas either from whole to part or part to whole ensuring that your audiences can think logically and understand harmoniously. 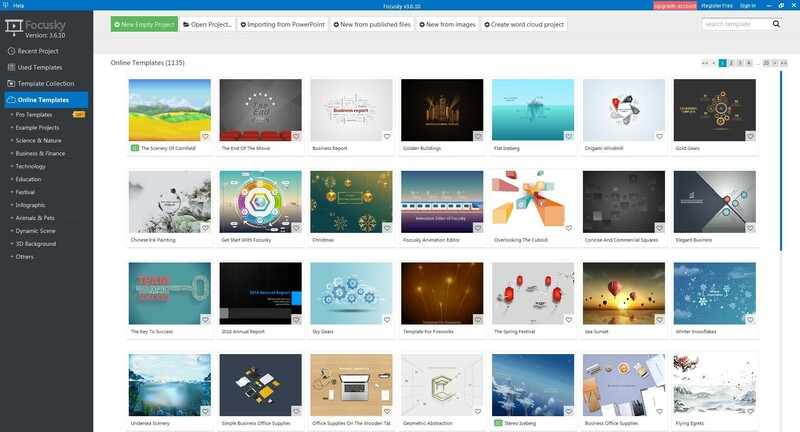 With Focusky, you have the capability to publish your presentation in 9 different output formats including Publish to Cloud, EXE, ZIP, HTML, Mac OS X Application, PDF, Video, HTML5 Web Page, MFS. For Email marketing, you are highly recommended to publish your presentation as ZIP format, which is of great convenience for you to directly send the ZIP file to your customers via Email. For video promotion, you can publish it as Video format, making sure that it can be uploaded to YouTube, Vimeo and other video websites. 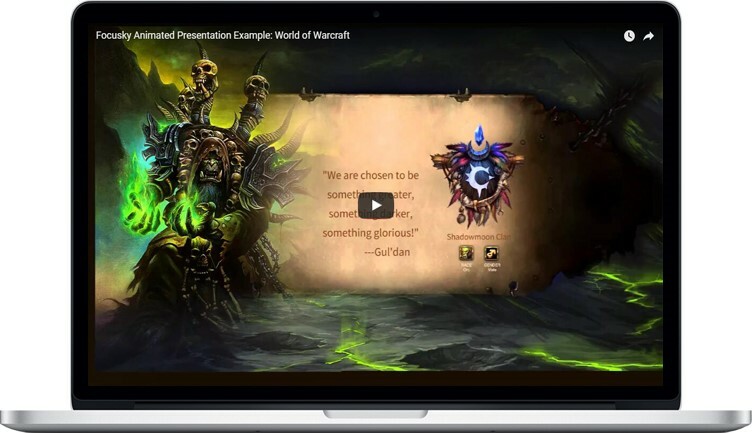 The integrated social media option makes it easy for you to share your published presentations across various social media channels such as Facebook, Google+, Twitter, LinkedIn, Pinterest, and Tumblr, which is regarded as the most effective and convenient way to get your presentations exposed to the users worldwide. Also, this means that anyone from anywhere across the world can view and share your presentations with everyone. Whatever be the device, computer, tablet, or even smartphone, making your presentations available is possible, which will help you get more mobile traffic. For smartphone users, it is quite a great feature that they don’t need to open a computer just for a view of your presentations, instead they now can use their smartphones to view your presentations in a place where they feel most comfortable while drinking a cup of coffee. How to Get the Free License Key of Focusky Pro for 3 Months? Step 2: Enter your email address to get the license key. Step 3: Create an account on http://focusky.com/ (or log in with an existing free account). Step 4: Visit the exchange page: http://focusky.com/gift-card-exchange.php to activate a Focusky account with the license key. Note: The program provides a 3-month license. You won’t be able to use your old paid account if you have one. The code will work only with the free account! Thanks to Taby from Focusky who provided me this giveaway opportunity.